The two essential ingredients to make a steam engine work are fire and water. The fire is created in the firebox using coal, this in turn produces heat which transfers to the water to produce steam. The firebox is surrounded by a water jacket. Inside the boiler there are smoke tubes which heat the water and convey the hot exhaust to the smoke box where the gases are drawn out through the chimney. 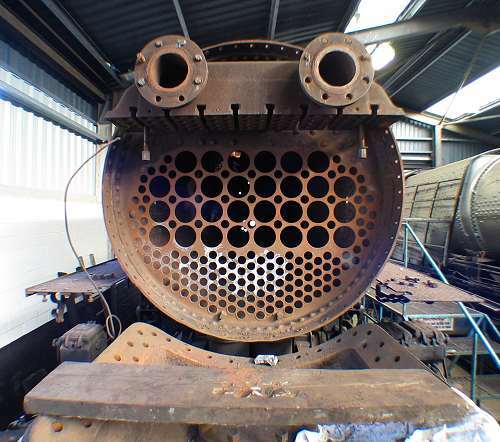 Picture right is of a locomotive boiler, the smoke box has been removed and you can see where the smoke tubes are positioned. The two large tubes at the top of the boiler are the main steam pipes which collect steam from the dome and transfer it to the steam chest and cylinders. 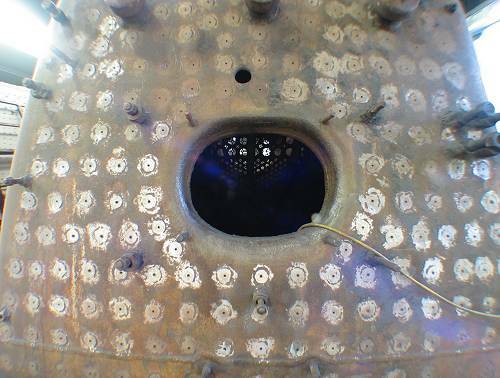 Picture left, is a view of a locomotive boiler the firebox end, showing the fire door hole where the fireman would shovel in the coal. The metal discs are the water space stays which are metal or copper rods that add strength to the space the water occupies between the boiler and the firebox. Without them the compartment would buckle and bend with the stresses from the heat of the fire.